This beautiful CHARM IT! 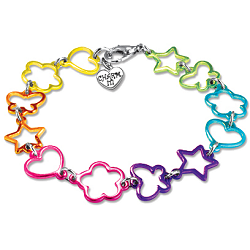 Rainbow Shapes charm bracelet is not only fun and fashionable but is versatile as well as you can wear it alone or easily attach your favorite charms to the open shape links. With hearts, flowers, stars, and butterflies in a rainbow of colors - yellow, orange, hot pink, purple, turquoise, and green - this amazing CHARM IT! 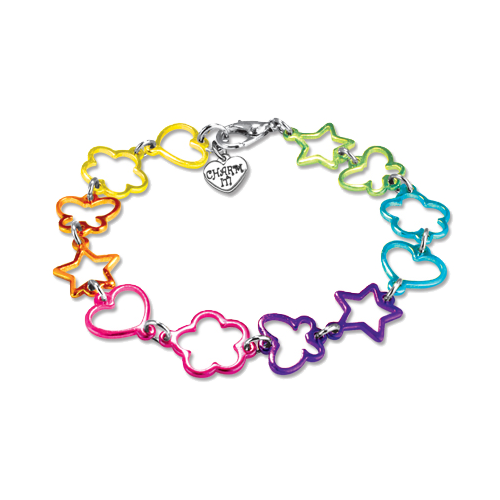 rainbow shape link charm bracelet looks awesome on girls of all ages and will be a hit with just about any outfit!